LANSING — Michigan House candidates and their supporters have now aired an estimated $1.37 million in broadcast TV ads this fall, according to an analysis of Kantar Media ad-tracking data and Federal Communications Commission (FCC) filings. That total — $1.37 million — is across 11 State House districts and includes ads that have run in the general election campaign through Monday, Oct. 24. Scroll your mouse over the districts in the below map to see which groups are airing broadcast ads in the races. The map is a joint effort of the Michigan Campaign Finance Network and MiDataLabs. The ad-spending total more than doubled in the past seven days, Oct. 18 through Oct. 24, and will continue to climb in the final two weeks. As of Oct. 17, MCFN had tracked only about $529,000 in broadcast ads. 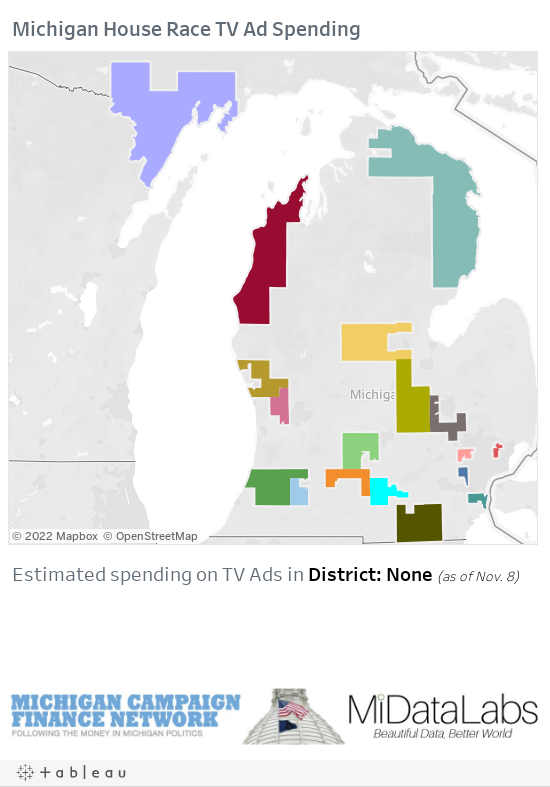 Broadcast ad spending has been heaviest in the Muskegon County-based 91st District, where Rep. Holly Hughes (R-Montague) is trying to fend off a challenge from former Rep. Collene Lamonte (D-Montague). Together, the two candidates’ campaigns have run about $270,465 in broadcast ads. Hughes has aired about $149,164 of that total. Broadcast ads have also been heavy in the 99th District, which includes Mt. Pleasant, and the Upper Peninsula’s 108th District. In the 108th, Republican Beau LaFave, of Iron Mountain, and Democrat Scott Celello, of Iron Mountain, have both been airing ads. The Michigan Republican Party and the Michigan Democratic State Central Committee have aired ads as well. Combined, there have been an estimated $184,106 in broadcast ads aired. In the 99th, Democrat Bryan Mielke, of Union Twp., the House Republican Campaign Committee and the Michigan Republican Party have all aired ads, totaling an estimated $168,000. The Republican candidate, Roger Hauck, of Union Twp., debuted a new broadcast ad today. Hauck is one of four Republican House candidates who began airing new broadcast TV ads today. Additional spending is happening on cable advertising. That spending is not included in the above map or the broadcast totals mentioned above in this piece. The House Republican Campaign Committee, the main committee of the House Republicans, and the House Democratic Fund, the main committee of the House Democrats, released new campaign finance disclosures on Tuesday. The disclosures covered from July 21 through Oct. 20. The House Republican Campaign Committee reported spending $839,140 across 12 House districts: 20th; 23rd; 30th; 39th; 56th; 57th; 61st; 62nd; 66th; 71st; 91st; and 99th. The House Democratic Fund reported spending $1.5 million across 11 districts: 24th; 57th; 61st; 62nd; 66th; 71st; 91st; 99th; 101st; 106th; and 108th. However, the House Republican Campaign Committee reported $2.2 million cash on hand at the close of the reporting period. The House Democratic Fund reported $568,623 cash on hand. In other TV advertising news, the Michigan advertisement that received the most financial backing in the seven days from Oct. 18 through Monday, Oct. 24, was a Michigan Chamber of Commerce advertisement that touts the two Republican-nominated Michigan Supreme Court candidates. The Michigan Chamber Commerce spent an estimated $663,000 on the ad over that seven-day period, according to MCFN’s analysis of Kantar Media broadcast ad-tracking data. Right to Life of Michigan spent an estimated $307,083 on broadcast ads over the seven-day period. In the month of October, Right to Life has spent about $615,113 airing broadcast ads. Right to Life has been running ads similar to the one below.